Graduate students from across disciplines were members of winning teams in the 2017 Lulu eGames. More than 350 people turned out for the April 20 LIVE event – an expo and awards ceremony – where winning entrepreneurial teams took home more than $100,000 in prize money to promote their products and businesses. One of the night’s top winners was VieMetrics, a company that has developed a simple device to help those with breathing problems like asthma or COPA predict when they might have an attack. Vitaflow is the name of the spirometer – instrument for measuring breathing capacity – developed by VieMetrics. The team is also turning its attention to new developments. James Dieffenderfer, a Ph.D. student in biomedical engineering and a member of the VieMetrics team, said the idea for the spirometer came out of a product innovation class, where master’s of business administration students are paired with engineers and designers to develop a product, build a prototype and bring it to market. Dieffenderfer’s class was assigned to develop a product to help with asthma management, and they came up with the Vitaflow. Those with breathing concerns can blow into the simple device and determine if it they could be at risk that day for an asthma attack. VieMetrics won first-place prizes in three categories, for a total of $20,000 in prize money: social impact, $5,000; design and prototype, $5,000; and new venture, $10,000. MBA student London White was a member of two winning teams: VieMetrics and Sakarotec, a company that is bringing to market a product to preserve more red blood cells in blood banks. The team included two engineers, Scott Frazee, a master’s student in biomanufacturing, and Karthik Narasimhan, master’s student in mechanical engineering. For a class, this interdisciplinary team was assigned to work with a research group from East Carolina University that had developed a compound to prevent red blood cells from bursting when frozen for storage. The $7,000 the team received for taking second place in the new venture category will go to start-up incorporation fees, White said. “NC State is a great place for entrepreneurs, especially tech entrepreneurs,” Frazee said. 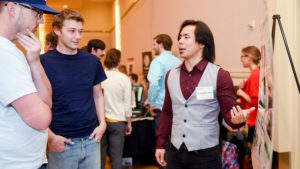 It’s a great place for STEM students to connect with business students, and the university has infrastructure in place to help connect student startups with funders, he said. Karthik and his teammates came together through the technology, evaluation and commercialization concepts course, offered through the graduate certificate in technology and entrepreneurship commercialization. The program pairs both engineering and business students with those who have technology interests from NC State University, East Carolina University and the Navy. Teams also have the option to license the technology they have worked on, which is what Sarkarotec plans to do. “This allows us to develop our own start-up, which deals exclusively with the business plan we have fleshed out in the year we have spent analyzing the technology for blood preservation,” he said. Another very successful eGames team was Ataristicians – a collaboration between seven master’s students in statistics and three undergraduate students in the College of Design. The company is developing a game that will help high school students to learn statistics. Ataristicians placed in three categories, netting nearly $10,000 in venture capital. They took first in arts venture, $5,000; third in built on a cloud (using IBM’s cloud services), $2,000; and third in social impact, $2,000. In addition, a product video the team created won the eGames video competition for $500. Statistical Association to make this happen. Alper Ender and Julien Chomette, graduate students in electrical engineering, were members of the Re-Cycle team that developed a lightweight, inexpensive and scalable bike share system that cities and universities could use. The team won $3,000, taking second place in the design and prototype category. All members of the team are bikers, and they have already been asked to “pitch” their idea to the town of Cary. “We’ll see where it takes us,” Ender said. Finally, Thrive Collective, “an organization that fosters collaboration and education in the nonprofit sector,” took second place in the arts venture category, earning $3,000. MBA student Ben Bradley is a team member. Learn about other Lulu eGames winners and eGames finalists.